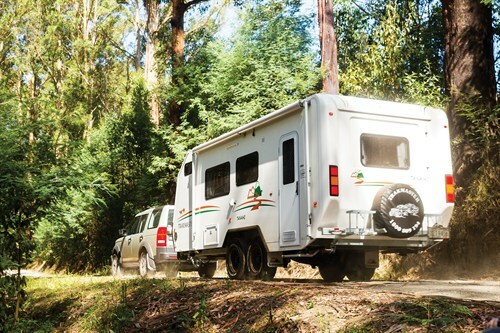 Built on a hot-dipped galvanised one-piece 150mm steel chassis with a Hyland offRoad coupling, the Tanami is available only as a full-height caravan in internal body lengths from 16-21ft (4.8-6.4m). The smaller versions have a combined shower-toilet ensuite and the larger ones, like our 19ft 6in review van, have a separate square shower cubicle. Because the Tanami’s fibreglass end panels are built exclusively for the Trakmaster by fibreglass and GRP specialists Bolwell, there is no flexibility to alter widths and all Tanamis are the same size across their beam – 7ft 6in. Where the Tanami differs from all other Trakmasters, though, is with its rounded corners, which, combined with the enclosed jerry can and gas bottles on the A-frame, greatly enhance its aerodynamics and improve the fuel consumption of its tow vehicle, according to anecdotal reports from customers. It’s certainly an imposing looking caravan by any standards and it’s not until you park it next to some other bitumen vans that you realise that appearances can be deceiving. 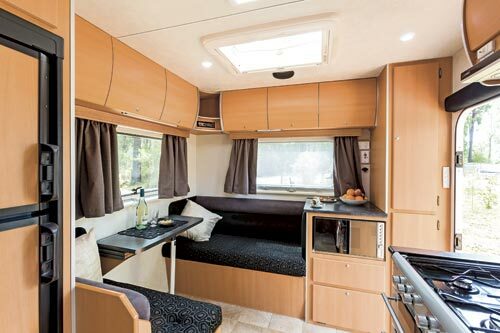 At 7ft 6in wide, it’s narrower than most caravans of its length, further enhancing its aerodynamics and enabling it to travel tracks that would damage wider vans. The 150mm section chassis has extra corner gusseting at the stress point where the A-frame joins the main rails; there is stone-deflecting mesh under the gas bottles; the van’s front corners are protected from damage by stone-deflecting black ABS shields; and the external water tap is mounted on the inside of the A-frame, out of harm’s way, rather than in the firing line on the outside as on most faux offroad vans. Look up and you’ll see what looks like a periscope behind the roof-mounted 135W solar panel. It’s the scoop for the van’s standard pressure vent that can be opened on very dusty roads to pressure the interior and keep it clean. At the rear of the van, further offroad cred is evident with the integrated roof air spoiler that assists in keeping the van free from dust and dirt. 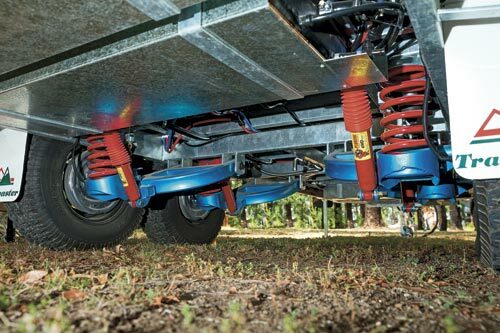 Crawl underneath to be further convinced and you’ll see that everything, from the test van’s three 82L water tanks, their plumbing and the Tanami’s wiring, is all well protected from impact and stone damage. Inside, via its rear door and folding alloy step, the test Tanami had an interesting and very workable layout, with the roomy L-shaped lounge and its bi-fold table to the right and ahead. At the front of the Tanami, there’s a full separate shower and toilet ensuite, with a central vanity unit. It’s an excellent, homely and workable layout that we could happily live with for weeks on end, just like Tanami owners surely do. The central kitchen is separated from the east-west (extendable) island bed by the angled kitchen bench and sink – and arrangement that delivers plenty of preparation and serving space. 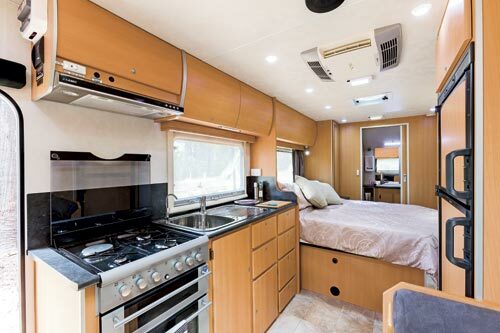 The 183L three-way Dometic fridge/freezer on the other wall is small by current caravan standards but, unless you are planning to be away from a food supply for several weeks, the Trakmaster team believes a large fridge can be a liability, as it has to be kept full to stop items bashing and crashing around on corrugated or rough roads. However, if it’s a larger fridge you want, there is space for it and you can add it to the option list. 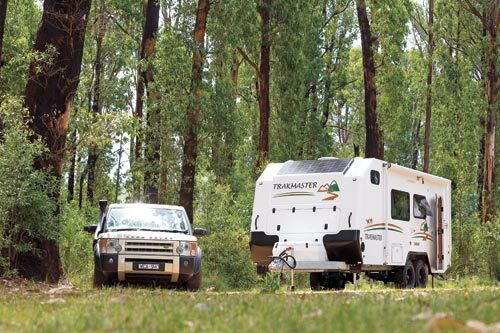 Costing six figures by the time you are finished with the long option list, the Trakmaster Tanami is priced in the top bracket for offroad caravans of its size. But, for long-term travelers who don’t want to be deterred by rough road conditions, it is a supreme ‘ship of the desert’ that is well equipped with all the essentials for remote area travel. 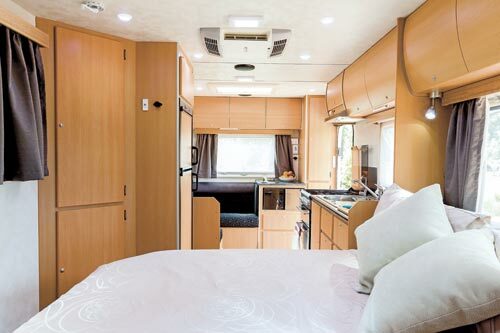 In some ways, such as its solid ‘picture frame’ timber interior fit out and furnishings, the Tanami is slightly, and reassuringly, old fashioned when compared to the latest caravans with their sleek CNC cut furniture and fashion décor. But I’m reminded of the Hugo Boss slogan here – ‘style is never out of fashion’ – and the Tanami has distinctive Trakmaster style that’s designed to last a lifetime. While we believe some things on the option list should be standard, few people will be disappointed with the very individual and comfortable caravan they get for their money.